Today is my anniversary. Not my wedding anniversary (that’s in July, silly). It’s my Israel anniversary. Exactly one year ago today I boarded a plane with two suitcases and moved to a country I had never before visited. It was on the plane that I realized how little I knew about Israel, how little Hebrew I knew. I had taught myself the alef bet (alphabet) and how to count to ten, but I didn’t even know how to say thank you. I was in the middle seat and the sweet old man next to me helped me put a bag overhead, moved when I needed to get out. And I couldn’t thank him. I felt suddenly helpless. I remember getting off the plane and seeing my husband for the first time in two months. Pure joy. But mostly I remember how disoriented and lost I was. The train to Be’er Sheva was foreign and confusing. How do you know which platform is correct? When we finally arrived in Be’er Sheva an hour and a half later the cab dropped off someone else first and so went on a circuitous route. That distorted my mental map of the city for months to come. It was Sukkot and my husband’s classmates were all on vacation. It seemed like the whole city was on vacation. “Do we live in a ghost town?” I asked. He swore it had been livelier the previous week. Looking back now it seems silly that this small city would seem so foreign. My Hebrew is still far from fluent (when I say far I mean far) but I feel confident in my daily interactions: taking the bus, going to the shuk, ordering food in a restaurant (and even reading a menu in Hebrew), traveling to Tel Aviv. In many ways, it feels like I’ve been here forever. In the last year I’ve also learned a ton about Israeli cuisine. I interviewed Janna Gur (my Israeli food hero and mentor on the subject), have met some wonderful chefs and eaten a lot of amazing food. The food blogging community in Israel is a strong one and I’ve found many blogs – and the bloggers behind them – to be incredible resources for a newbie like me trying to navigate an entirely new culinary culture. Cafe Liz, Food Bridge, and Israeli Kitchen are three that immediately come to mind. Of course my close friend Beth over at Beth Michelle is my partner in culinary crime and has made every exploration more fun. And I’ve been on food and wine tours around the country with Cook in Israel, Israel Food Tours, HaAtelie Talie Friedman, and My Israel Wine Tours. Sweet Potato Pancakes from Tel Aviv’s Orna and Ella restaurant (along with two other latke recipes) and Marak Kubbeh Adom, the ultimate Iraqi-Jewish comfort food. A spread of Israeli Mezze (including Moroccan carrots, tahina dip, and babaghanouj) and my take on the ultimate Israeli drink, a Sparkling Limonana. What an a amazing adventure you are on. I love all the photos. Thank you so much! It’s definitely a fun adventure and continues to be one each day. <3 <3 <3 <3 I just saw myself 5 years ago… Even though I had already visited Australia and spoke English (which is a HUGE advantage, even though it took me a LONG TIME to grasp the accent ;P)… everything was new and different. It took me a couple of years to get fully adjusted and now I would never be able to go back to live in Italy! Happy Anniversary! That is so great. Wow, five years. I think even without the language barrier living in another country is, well, foreign. Especially in little ways that you didn’t expect, foodstuffs you can’t find, television you can’t watch. It’s different for us because in another two years we will move back home. And then I will be left missing Israel something terrible, having just fully adjusted! Happy Anniversary Katherine! You arrived in Israel and 5 days later you started blogging? That’s amazing! I enjoyed writing of your post today… you really a great writer and I’m drawn into your story (is that how you say in English?). You definitely reminded me of my first day in the US. I was 20, didn’t know anything about it here, and I am surprised how my parents could agree with me to come over here. I enjoy reading about you and Beth’s adventures all the time. Looking forward to more recipes and great stories!! Haha, yes I started the blog pretty quickly. I knew from the outset that I wanted to as soon as I arrived. I think I had taken care of some of the details before I left, like buying the domain name and maybe even picking out a theme. Thank you so much for your sweet compliment Nami! I love hearing about when you first went to America. I’ve visited Israel a number of times and was in Beer Sheva once. I love following your blog and reminiscing about Israel. The food, the history, the music, the food ( oh did I already say that)! Love your story and love your blog. 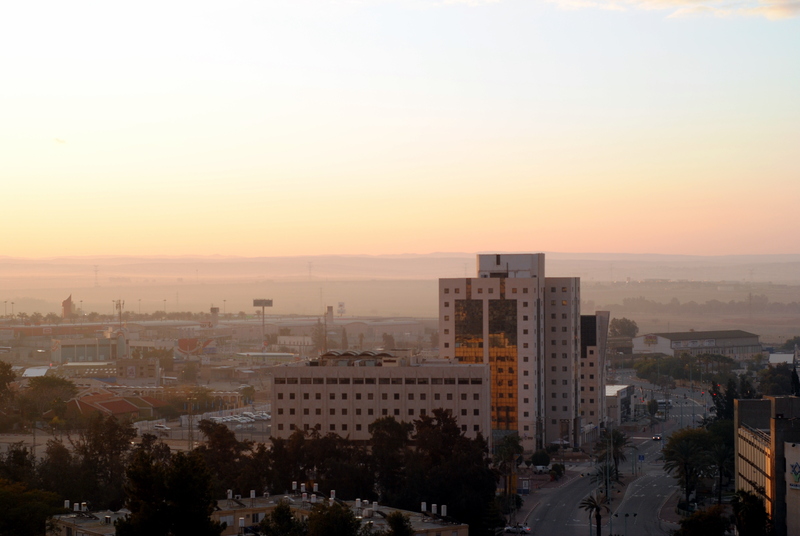 That is so great that you have been here before (both Israel and Be’er Sheva!!). I also love the food, and mostly the food 🙂 But everything about living here is quite remarkable. Come back and visit soon! Mazel tov on your year in Israel and your blog’s anniversary! Your writing and photography are just lovely. I enjoy following your travels and culinary adventures and am envious of your time in Israel. I haven’t been there for 3 years and am overdue for a trip. My husband went to high school in Afula as an exchange student and spent a year at Hebrew U, so we try to visit as often as possible. Thank you Hannah! You’re so sweet. I hope you come back to visit soon! We can visit markets together 🙂 That is so cool that your husband spent so much time here. I still have so much to explore! Shana Tova to you too!! what a great experience to be a part of! I hope the next year bodes just as well for you! Your story and your pictures are simply amazing! I can only imagine how could it be leaving all for an unknown Country! Happy anniversary! What an adventure you’ve had. I’ve always wanted to up and move somewhere completely new, but I guess it has never been in my cards. You have such a beautiful blog and the pictures are gorgeous. I really enjoyed browsing around! My best memories are from my experiences living abroad. Lucky you! It’s so nice to read about your impressions. Where did you live abroad? In college I studied abroad in India, but we didn’t stay in one place for more than a few weeks so it didn’t feel entirely like living there. We definitely *live* in Israel. Hey! How did I miss this post? You’ve certainly got a grasp on Israeli cuisine in the past year 😀 We’re waiting for more to come! Aw thanks Liz! So much of what I’ve learned about Israeli cuisine has been thanks to you and your fabulous blog 🙂 So good to see you last night!